April Thompson, LCSW, is a clinical social worker currently working as a Cognitive Behavioral Therapy Trainer with the Center for Deployment Psychology (CDP) at the Uniformed Services University of Health Sciences (USU) in Bethesda, Maryland. 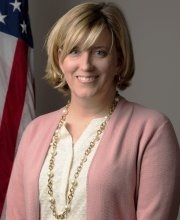 In this capacity, she is responsible for the development and delivery of both live and web-based trainings to military and civilian mental health providers on deployment-related topics. Ms. Thompson received her Bachelor of Arts degree from Pepperdine University in Malibu, CA and her Master of Social Work degree from University of Pennsylvania. For over 20 years, Ms. Thompson has specialized in military child and family issues especially in the area of domestic violence and family maltreatment prevention, response and treatment. She has worked as a clinical counselor on military bases in Japan, Florida, Virginia and Hawaii. Prior to joining CDP, Ms. Thompson was a clinical care coordinator overseeing the training and quality control of clinical documentation for contracted counselors working at Navy bases throughout the continental United States. Financial: April Thompson is employed by Center for Deployment Psychology. Non-financial: April Thompson has no relevant non-financial relationships to disclose.